Arrive in Kolkata. After completing formalities with customs and immigration, you will be received by our representative with Traditional Indian Welcome (with garlands). 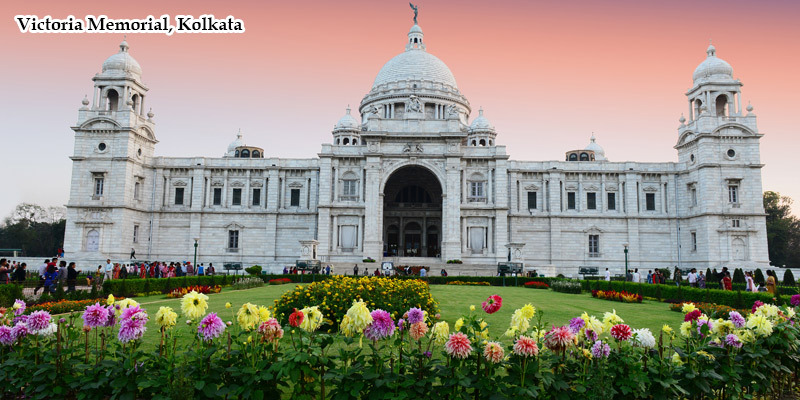 Victoria Memorial: Modeled on the Taj Mahal, this is a splendid architectural structure in white marble, which was built in the early 20th century in memory of Queen Victoria. Indian Museum: Established in 1878, this museum is built in Italian architectural style and is considered as the largest museum in the country and one of the best in Asia. Eden Garden: Created in 1840 and named after the sister of Lord Auckland, situated in the North-West corner of the Maidan are small & pleasantly laid out Eden Gardens. Ochterlony Monument: Now officially renamed the Shahid Minar, this 48m column tower over the northern end of the Maidan the Monument was set up in 1828 and named after Sir David Ochterlony. After breakfast at hotel, you are assisted in your departure to Domestic airport to connect your flight for Bagdogra your entry point to Darjeeling. Upon arrival at Bagdogra received at the airport and drive to Darjeeling. Breakfast at hotel. Afterwards embark on your sightseeing trip of the city which would include your visit to Tiger Hill to see sunrise over the spectacular East Himalayan ranges and visit Ghoom, oldest Buddhist monastery in the region, and a Tibetan settlement. Return to the hotel after the sightseeing. Evening free at leisure. Overnight at hotel. After breakfast this morning drive to Gangtok. Perched atop a ridge at a height of 1520 mts. lies Gangtok, a tantalizing town touched by a panorama of colours. Gangtok the capital of Sikkim, is today a busy town bustling with hectic activity. Its captivating architectural beauty radiates with pagoda-like wooden houses, painted turquoise roofs and gay bazaars. Undoubtedly modern times have wound their way into this picturesque town, but the gently swaying and elegant costumes of the Sikkimese people, their smiling faces, the unhurried pace of their life-style. After breakfast embark on your sightseeing trip of the Town which would include your visit Rumtek said to be the only monastery outside Tibet built in true Tibetan style, the bazaar and the Tibetan Institute. Return to the hotel after the sightseeing. Afternoon at leisure. Overnight at Hotel. After breakfast drive to Bagdogra to connect the flight for Kolkata. On arrival in Kolkata received at the airport and transferred to the hotel. Rest of the day free at leisure. Overnight at Hotel. After breakfast you are escorted to the airport to connect the flight for Bhubaneswar. On arrival in Bhubaneswar received at the airport and transferred to the hotel. Rest of the day free at leisure. Overnight at Hotel. After breakfast embark on the full day excursion to the fabulous Sun Temple at Konark built in 13th century A.D. on the shores of the Bay of Bengal. Standing in lonely grandeur on a deserted stretch of coast, and designed as a chariot to the sun god Surya, the temple stands on twenty four enormous intricately carved wheels pulled by seven horses. Sculpture and carving cover the entire structure, ranging from tiny, cameo like figures to groups of colossal proportions. After sightseeing, continue to the bustling pilgrim town of Puri famous for its vast Jagannath Temple and its never ending beach, crowd free and peopled only by local fishermen with their boats. Stop en route at the village of Pipli where applique in vivid colors is the local handicraft. Return early in the evening to Bhubaneswar. Overnight will be in Bhubaneswar. Breakfast at hotel. After breakfast free till departure. You are escorted to the airport to connect your flight for Delhi. Upon arrival at the domestic airport you are received aand transferred to the hotel. Rest of the day free at leisure. Overnight will be in Delhi. After the sightseeing you are escorted and transferred to the airport to connect your flight back home.